How Can You Build Contemporary Garden Offices Easily? 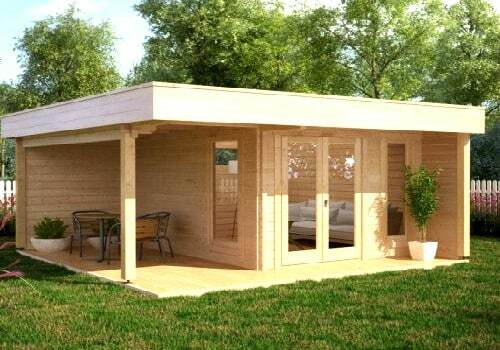 The growing trend for contemporary garden offices is linked to the growing trend to self-employment in the UK. This number has reached 2.5 million workers recently and continues to grow. The internet has changed the way we work. Electronic connections enable networking in companies as well as in between different businesses. If nearly all communication during a working day is via new media be it at the computer workstation or via smartphone, then it is no longer required to commute to an office inside a company building every day. This process is slow but steady and many employees also urge their superiors into this direction because the outlook of making a short walk through their own garden to their very own garden office looks much preferable compared to the daily nerve-wracking and time-consuming commute to their offices at the company. These mostly wooden garden rooms are designed as garden offices and offer luxury garden office space of all designs and sizes. A small garden office of just less than 10m2 may be much better to contain a single workstation than a room in the main house, where it might be cramped into a sleeping room or any other room with a different function and where everyday life in the house, ringing phones, ringing door bells, children, spouses, and many other things distract the attention of the self-employed worker or the one working at a company with the allowance of X days of work from home per week. Other more prestigious garden buildings that really earn the label “Contemporary Garden Office” have a modern design are representative enough to also allow public business. Some of them are also big enough to house a whole branch of a company with room enough for six to eight workstations. What changes for people working in contemporary garden offices? In their own garden offices, people feel more at home. The artificial borders between free time and work time start to fade. They identify more with their work, because they work from a private space, decorated according to their own ideas, often times much more comfortable with a sofa nearby for small creative breaks with the look into the garden. No boss controls, what they do at any given time, and the work itself, the essential questions: “Is the work done?” and “How is it done?” gain priority over questions like: “How am I dressed?” or “How will I harmonize with my colleagues today” or other more work unrelated questions that often gain too much attention in an office community. Working at home just offers much more comfort than working out. Garden offices have become very popular due to a wide range of reasons. Luxury, peacefulness, and freedom from stress are just the right mixture to produce much more creative professional ideas. How do employers profit from contemporary garden offices? So for the companies, it should not be the question: “Is someone trying to skive off work by suggesting to work in their garden office?”, but rather: “Will the comfortable working environment bring out the best in this employee?” Anyhow, it can easily be controlled, if the work gets done, but in more and more jobs, creativity and a good mood at work become more and more important for the quality of the results. Moreover, many employees feel grateful for the chance to save the time that was otherwise wasted for the daily commute, thus being able to spend more time for the more important things in life like friends, family or education. For the companies, it is also a financial thing. Having their employees work in their very own contemporary garden offices enables them to spare the costs of workstations, rent for office building space, and of course creating some kind of greenery or park around the building to have green dominate the look out of the windows which is supposed to be a good colour to enhance well-being, calmness, and motivation at the same time. All of this can be outsourced at a fraction of the costs to the employee, who will happily take the chance to create his own space in his contemporary garden office just a short walk from home amidst the peace and tranquillity of his own garden.